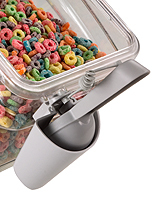 This clear bulk bin is designed for holding loose cereal, beans, nuts, trail mix, and other volume displays of dry foods. 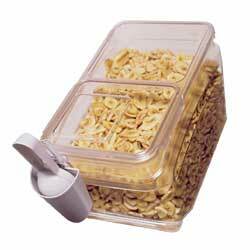 These plastic containers can be easily displayed or mounted on counters, cabinets or gondolas for superior visibility. The clear polycarbonate bulk bin holds three gallons dry foods or goods and is dishwasher safe, stain resistant, and 35x stronger than "regular" acrylic. 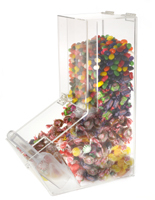 These self-serve dispensers are great choices for supermarkets and health food stores. 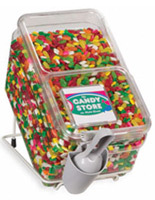 Our clear bulk bin comes with its own attached scoop and holster for sanitary dispensing. 8.8" x 14.5" x 20.0"